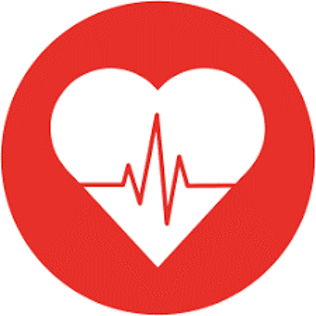 Monitoring the health of your fundraising program. When it comes to our personal health and well-being, we’re all familiar with the key metrics: blood pressure, pulse, weight, BMI, cholesterol, and blood sugar levels. Just like you monitor these health indicators, you need access to the vital signs that indicate whether your donor file is healthy, or needs resuscitation. Technology now gives all fundraisers the ability to track key metrics quickly and inexpensively across direct mail, telemarketing, social media, and other measurable channels. Balancing art and science requires A.I. – Actionable Intelligence. 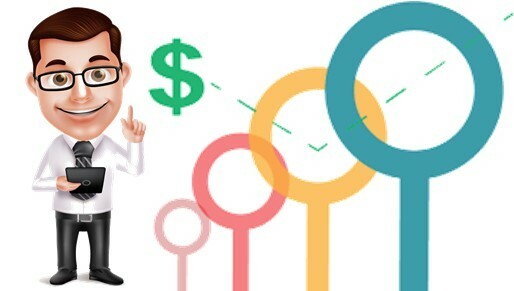 Analysis that gives you the ability to confidently monitor the health of your fundraising program and the insight to know how to move those metrics to achieve your goal. A definitive guide to the metrics that matter. 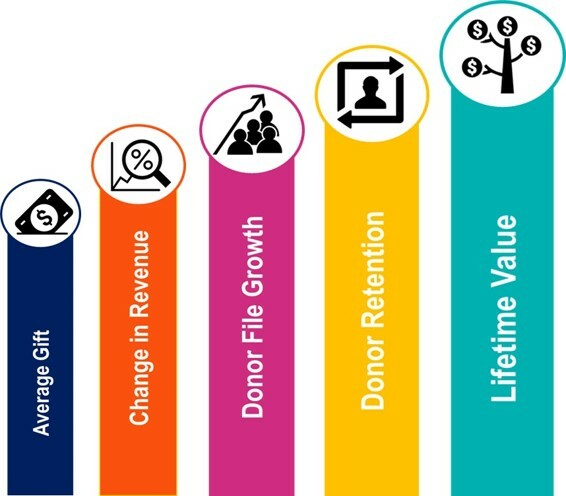 This DonorTrends Guide provides an incisive look at the key, real-world metrics fundraisers should be using, in order to run a more effective and cost-efficient program. 7 basic questions every fundraiser needs to answer. Every fundraiser needs a fundamental foundation of knowledge about their donor file and its revenue stream. Without these key metrics, there’s no way to define, track, and steer a fundraising program. We believe you have the right to know and understand the answers to these critical questions for free and without hassle. If you don’t know where to start – don’t panic. We’re here to help. Is my donor file size growing or shrinking? How loyal are my new donors? How loyal are my existing donors? 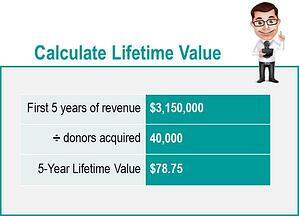 How much is a donor worth after 5 years? 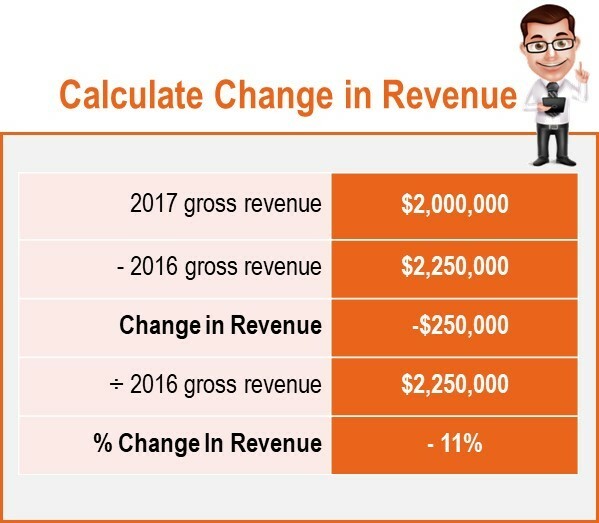 How much has revenue changed from year to year? On average, how much does each donor contribute? What can I do to protect / grow donor retention and revenue? 5 fundraising vital signs to track and benchmark. The process begins with benchmarking — setting a starting point from which progress can be measured and evaluated. Unfortunately, all benchmarks are not created equal. Even the most meaningful benchmarks are only useful if the fundraiser can understand what they signify, how they’re calculated — and most importantly — how to influence them. The following is a look at the basic definition and calculations for each of the 5 Fundraising Vital Signs. These metrics enable fundraisers to benchmark and evaluate the effectiveness of various strategies and tactics. They also highlight “weak” or “troubled” areas that may need improvement such as response, conversion, reactivation, and upgrading. First Gifts = Revenue generated from new donors. Existing Gifts = Revenue generated from donors who had already given a gift prior to this year. 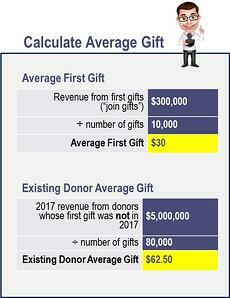 Typically, existing donors have a higher average gift than first-time givers. This simple metric should be tracked against both the Consumer Price Index and the sector average. Understanding if your organization is keeping pace with the ever increasing costs of fundraising, as well as the pace of growth for other nonprofits, is vital to long-term sustainability. 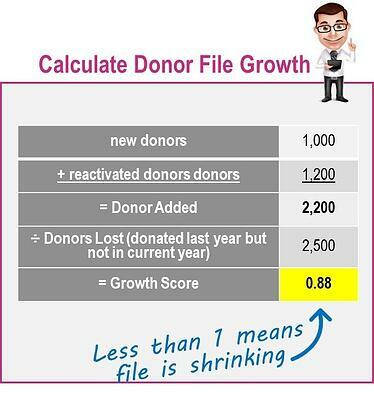 The Growth Score evaluates the number of donors added to the file compared to the number of donors lapsing. Implement strategies for the prevention of future “bleeding” or donor attrition. 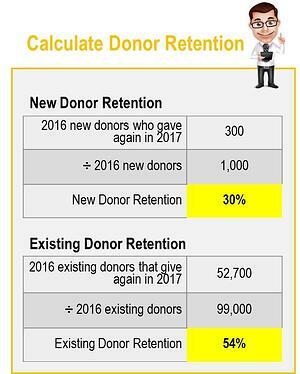 Donor Retention determines how reliable and predictable your donors are by calculating how many donors are committed to your organization — and how many have become inactive. 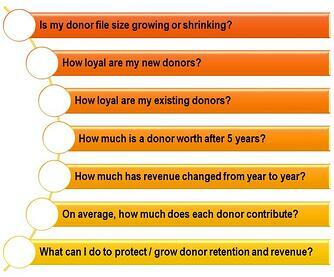 Understanding of how many donors continue to give is essential to future success. New Donors: A donor who has made their first gift to your organization. Existing Donors: A donor who has given in at least the two previous years to your organization. Perhaps the most important metric for a fundraiser - Lifetime Value (LTV) indicates how much gross revenue you can expect from your donors over the first five years. This metric is essential to establish effective investment levels for acquisition of new donors and the development and growth of current house file donors. DonorTrends believes you need to know 2 vital things before you can move any of your target metrics. What would a 2% increase in this metric yield? You need to know what the impact would be before you create an expense budget to achieve the goal. How can I move this metric? Hello Captain Obvious! Of course you need to know the “ how.” But many are not confident about how to build this into the strategic plan. An Objectives Tree [pictured on the next page], will help to clarify / focus your fundraising goal[s]. What are you trying to accomplish? Data should be used to strengthen your fundraising strategy and meet specific objectives. 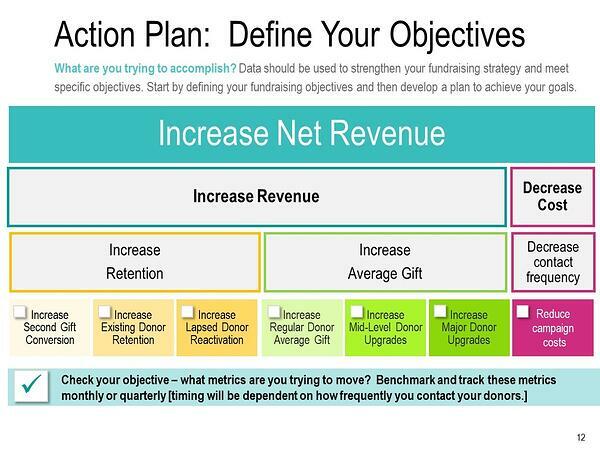 Start by defining your fundraising objectives and then develop a plan to achieve your goals. The image below will help you clarify your fundraising focus. This tool is called a fundraising objectives tree. The first [top] branch of the tree is Your Why. Here's an example of a focused 'Why': Increase net revenue 3%. The fact is, many organizations jump into their annual fundraising plan blindly. Their budgets aren’t informed by the insightful and actionable analytics needed to make the most effective, top-line strategic decisions. Plus, the process of improving the performance of their donor files is often seen as a once-a-year initiative — rather than the continual month-by-month monitoring and enhancement effort that’s truly needed to maintain growth. Better understanding of where your file is today is the crucial first step to improving performance and revenue across every level of the donor pyramid. That understanding helps guide the equally important task of developing an effective strategy and action plan for the various challenges and donor clusters you need to address. If this seems overwhelming, don’t panic. 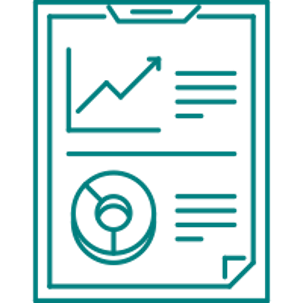 DonorTrends is here to help you quickly assess the health of your file and set goals for future fundraising success. We invite you to calculate the your fundraising vital signs [simply click the button below].